Windows differ in each property; we have learnt by designing and fitting shutters in many properties throughout the South Coast, that there are no standard sizes or standard windows! The small windows in this lounge in the South Coast of England are small single pane windows, not what you’d expect from a “standard” lounge. Shutters fitted on these small single pane windows have been designed to match the style of the windows, a single shutter, one opening left, and the other one on the other single pane window, hinged to open right. 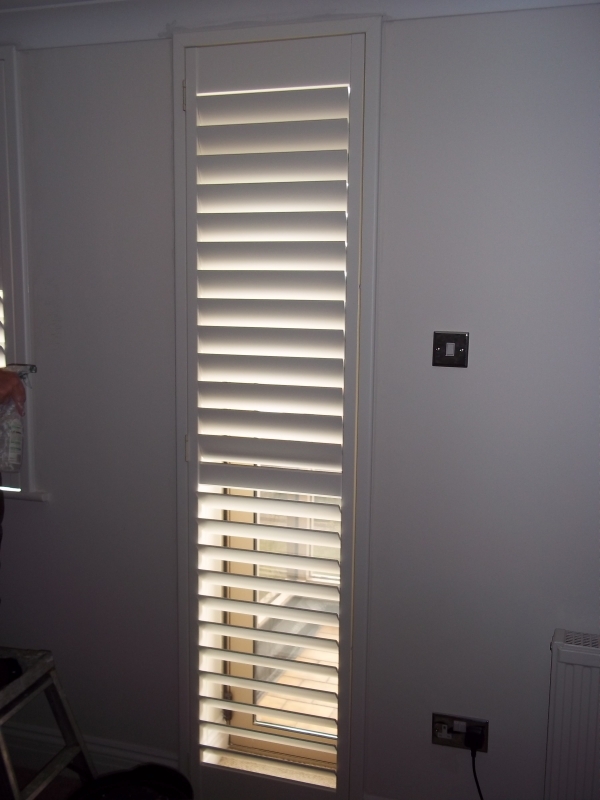 The customer has chosen larger slats to allow lots of light to enter between the slats when the slats are fully open.The larger slats mean that less slats are fitted in a shutter panel. And they are obviously spaced further apart from each other. Less horizontal lines breaking up a window means that the look is slightly more modern. The customers chose another design feature which helps create a modern look for the window shutters to match they simple, modern décor. They opted for the shutters to have no push rod on the front of the panels to operate the slats opened and closed. Instead they opted for our hidden, Open Sky, push rod system. This seemingly “rodless” shutter has slats which open and close in unison. The open sky push rod system works by connecting the louvers in the shutter together by connecting them on the back of the panel towards the window.